Add front panel access to 22 different types of flash memory cards. 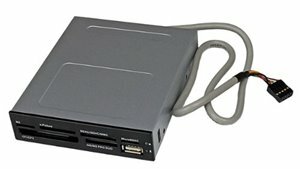 The 35FCREADBK3 3.5" Multimedia Card Reader offers quick and easy access to the most popular flash card formats, from the front panel of almost any desktop computer.Suitable for quickly accessing memory cards from virtually any portable media device (e.g. digital cameras, MP3 players, etc. ), this versatile media card reader supports 22 of the most popular card types, including: Compact Flash (CF type I), Secure Digital (SD/miniSD/microSD/SDHC/SDXC), MultiMediaCard (MMC/RS-MMC/HS-MMC/MMCmobile/MMCplus/MMCmicro/HC-MMC), MemoryStick (MS/MS Duo/HS-MS/MS PRO/MS PRO Duo/MS PRO-HG Duo/MS-ROM/M2), and xD Picture cards, this reader is ready to handle the memory cards from virtually any portable device from cameras to music players.The card reader also allows simultaneous access to multimedia card types (excluding same type media), allowing you to copy files from or between different cards at the same time.